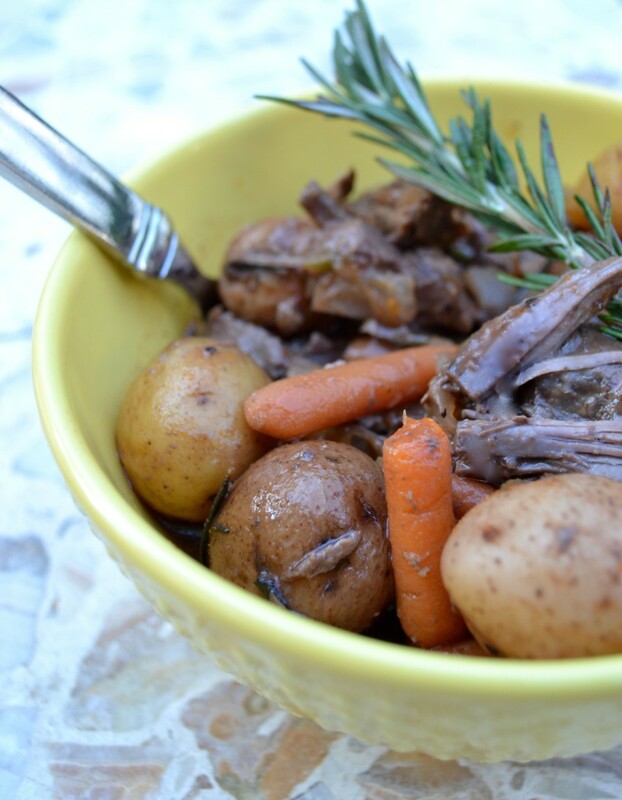 The fire is crackling, leaves are cascading from the trees, and you’re hunkered down at the kitchen table, dipping your crusty bread into the delicious herb and wine-infused beef stew that’s been simmering away all day long. 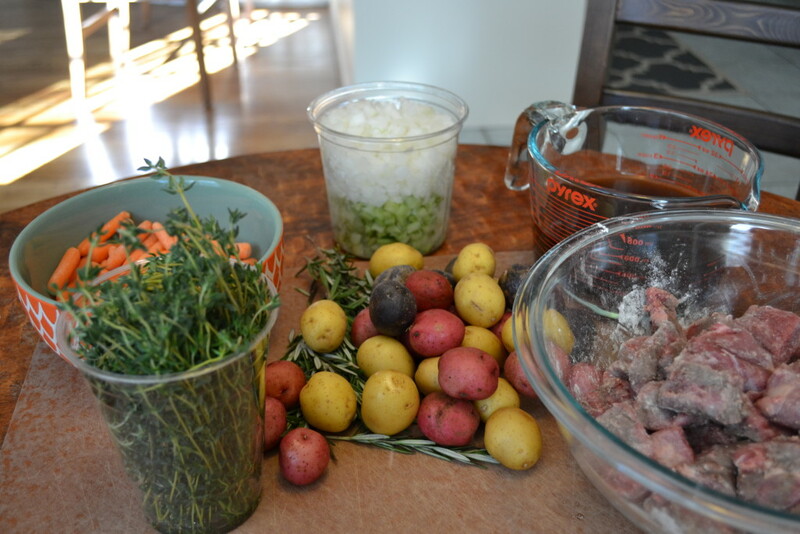 No, it’s not a Sunday night, it’s a Tuesday night, and you made this stew with only 10 minutes of prep that morning! You are a weeknight dinner rock star. Beef stew is the ultimate cold weather comfort food, and the ultimate one-pot meal. 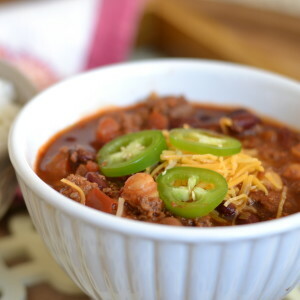 I love any meal that has meat, starch and veggies combined in one delicious bowl, and can simmer in the crockpot or on the stove for hours — growing tastier and more tender — until everyone’s ready to eat. BUT…beef stew can be a bit labor-intensive to make. Most recipes involve a lot of measuring, searing, chopping, stirring and dicing in addition to the slow cooking process. I actually enjoy measuring, searing, chopping, stirring and dicing when I have the time and energy to do so. I would gladly spend a chilly Sunday afternoon tending to a pot of beef stew with some good music playing and a hearty glass of red in my hand. However, since those leisurely cooking opportunities don’t arise as often as I’d like, I set out to create a beef stew recipe that I would be willing to make regularly, which meant it would need to be as simple as possible. To accomplish that, I eliminated the searing process, and made this a “no chop” recipe by using ingredients that are either pre-chopped (like the onions, celery and beef) or small enough that chopping is unnecessary (like baby carrots and small whole potatoes). I also used an herb bundle to skip the step of having to dice up the herbs. I made this stew last night, and I’m pleased to report it was every bit as good as the complicated beef stew recipes I’ve made in the past. Just put your ingredients in, set your slow cooker, and come home to a delicious, comforting home-cooked meal that will put Martha Stewart to shame. 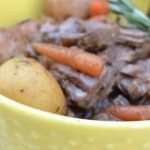 Cooking note: As is the case with many of my recipes, this beef stew is best served with some warm, crusty bread! A hearty beef stew that's can be prepared in minutes. Combine the flour with several shakes of salt and pepper in a bowl or gallon ziplock bag. Add the beef cubes and toss to coat. Place diced onion and celery into the bottom of a slow cooker. Add carrots and potatoes. Use twine to tie together approx 3 sprigs of rosemary and 3 sprigs of thyme, and place the herb bundle into the crockpot. Add floured-beef on top. In a large measuring cup or small bowl, stir together beef broth, wine (if using), Worcestershire sauce, and tomato paste. Pour over ingredients in the crockpot. Cover and cook until meat is very tender (approximately 6-7 hours on high or 9-10 hours on low; cooking times may vary depending on slow cooker temps). Add additional salt & pepper to taste. 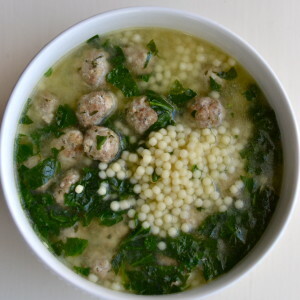 If you'd like to thicken your broth before serving, you can do so by creating a cornstarch slurry. Simply spoon some of the hot stew liquid into a small bowl and add a tbsp of corn starch. Stir together until blended, and then add it to the crockpot. You can repeat this more than once until you've achieved the desired thickness. 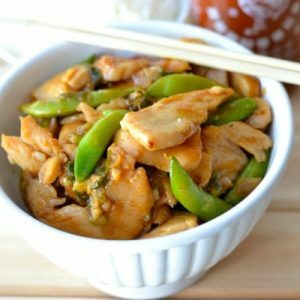 I love that you don’t have to chop anything in this recipe! I adore all those cute and colorful little potatoes but never seem to buy them. Now I will and make this delicious looking stew. I really like your site and message. I used to say that I wanted to be that Zen mom. The one who doesn’t stress about things and doesn’t worry about other moms and kids. I’m probably not making much sense but the Zen mom thing is about simplicity in just about everything and I’ve always wanted to be like that. I have a LONG way to go but that is why I like your site so much. (sorry for the book). The “no-chop” is a little misleading since you have to chop the onion and celery. In the instructions, I said to buy pre-chopped celery & onion at the store to make the recipe easier. If that’s not available at your store then, yes, you’ll have to chop those two things.